Please, note that drawing electron flow arrows starting from lone pairs is only possible when lone pair visibility is turned on in View settings. For describing the movement of electrons in the elementary reaction steps of a complex mechanism in Marvin JS, you can choose between two types of electron flow arrows: Single or Double . The former arrow type is for visualizing single electron movement, while the latter is for displaying the movement of electron pairs. As a chemically intelligent editor, Marvin JS does not allow drawing more than one single electron flow arrow per electron, as well as no more than one double electron flow arrow per lone pair. See a video tutorial about how to draw electron flow arrows in Marvin JS. Select the preferred type of electron flow arrow button. Drag the electron flow arrow from the electron(s) to the target atom or bond. A grey feedback of the arrow appears. The default setting is the incipient bond, but after creation you can change it anytime. If the radical is too small to click on, after selecting the electron flow arrow tool, you can click on its atom to magnify them. When you drag from the radical (or lone pair), the zoom level changes back to the original state. 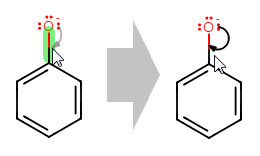 The source atom should have at least one explicitly displayed radical or lone pair from which the arrow can be dragged. The endpoint of the arrow will be the midpoint of the target bond. In this case, incipient bond type is unavailable. A bond can be the target of an electron flow arrow only if it is adjacent to the source atom. Drag from the source bond to the target bond. Drawing an electron flow arrow from one bond to another is only possible if these two bonds have an atom in common. Drag with the electron flow arrow tool from the original bond to the atom which will belong to the newly formed bond. 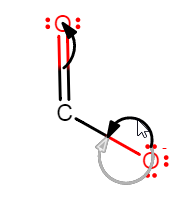 In order to add the other electron flow arrow, draw a single electron flow arrow from this radical to the atom on the other end of the incipient bond. on an incipient bond between two atoms which do not have a common existing bond. The arrow changes back and forth from incipient to normal arrow. To change the origin of the electron click on the arrow. When you want to draw a single electron flow arrow pointing to an atom instead, click on it again. For the third click, the arrow head jumps back to its original position. Choose one of the electron flow arrow tools or the selection tools, then drag the electron flow arrow to change the arc of the curve. The new arrow will be shown in black, and the old one is greyed out. Choose one of the electron flow arrow tools or the selection tools, then drag the electron flow arrow to the desired position. The new arrow will be shown in black, and the old one is greyed out. Electron flow arrows can be selected either by clicking on them with the Rectangle or the Freehand selection tool being active, or by dragging over them with one of the selection tools. In the latter case, you can only select the electron flow arrow without its source and target atom or bond if you use the Freehand selection tool; while using Rectangle selection, the arrow can only be selected with its source and target. Deleting electron flow arrows can be accomplished in the same way as with other objects: using either the Delete toolbar button or the the Delete keyboard button. Please, note that an electron flow arrow is automatically deleted if its source or target atom is deleted or changed, as well as when one of the atoms belonging to its source or target bond is deleted or changed (incipient bonds included as well).